Power Star Pawan Kalyan is very much busy shooting for his next film now. The movie is titled as Katamarayudu, and Shruti Haasan is playing the female lead role. This movie is the official remake of Tamil super hit film Veeram. Chaitanya Krishna, Kamal Kamaraju, Shiva Balaji and Ajay are playing brothers to Pawan Kalyan in the film. Ali is also seen in an important role in the movie. The film is directed by Dolly and producer Sharath Marar is bankrolling it under North Star Entertainments banner. The film is likely to hit the screens on 24th of March. Unlike other Tollywood heroes, Pawan Kalyan is one such actor who never fails to incorporate at least one local and regional folklore in his films. Now, as per the latest reports the Katamarayudu team is currently busy with the shooting of a folk song. Anup Rubens, who is scoring the music for this Pawan Kalyan starrer has updated this interesting news. Sometimes, he even sings his own songs and there is buzz that Pawan Kalyan is giving his vocals for this folk song in his upcoming project. Usually, Pawan uses Uttarandhra folks as he was addicted to those when he was undergoing training in Satyanand film Institute in Visakhapatnam, but later Pawan has started using the Telangana and Rayalaseema folk songs. 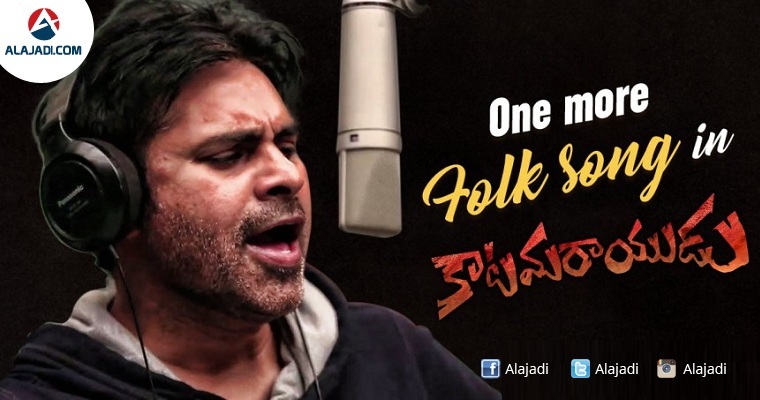 Now, this song will also be on those lines and it is a known fact that the title itself taken from the folk song sung by him in Attarintiki Daaredi.